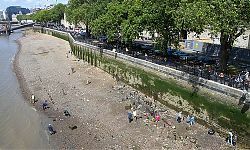 The week of fieldwork at the Tower of London was a tremendously exciting opportunity to look not just at the foreshore and newly revealed features there, but also at the much-repaired, much heightened and much re-faced river wall. We invited Dr Mark Samuels, a specialist in these matters, to help us out. 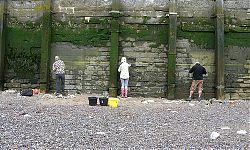 He pointed out that the face of the wall comprises a variety of different stone types, including Kentish Ragstone (usually indicating a medieval date), at least two sorts of limestone (Portland-type, suggesting refacing in the 17th century or later) a northern more laminated type (refacing no earlier than the 18th or early 19th century) and granites around Traitors Gate (19th century rebuilding). 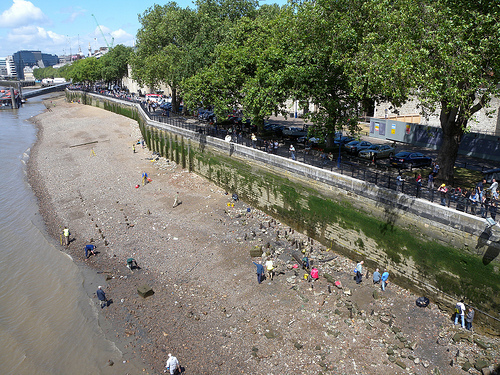 For those interested in medieval archaeology, we seem to have substantial runs of medieval ragstone walling forming the lowest courses of the presently exposed wall, sometimes surviving for up top four or five courses: this must represent the oldest extant riverwall on the Thames, having been washed by the tides for 600 years..
For those interested in the Tower Moat, we have also identified the position of the large gap cut through through Tower Wharf to allow the moat to drain directly into the Thames, a scheme that was abandoned in 1802, when the hole was blocked up (with limestone ashlar). For those interested in Blitz damage and repair to river walls, we have clear evidence of bomb damage (and subsequent patching up) near Traitors Gate. 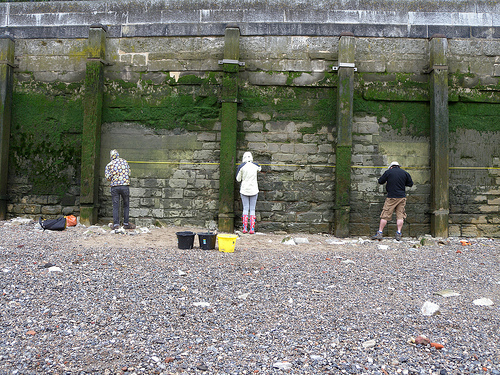 Our river wall is thus a remarkable historical document, with lots of Thames tales embedded in its masonry courses.